The Roll of Honour commemorates those from Dinmore and District who served in World War One. The roll was originally unveiled in 1916 and contained 22 names. Additional names were added at a later date. 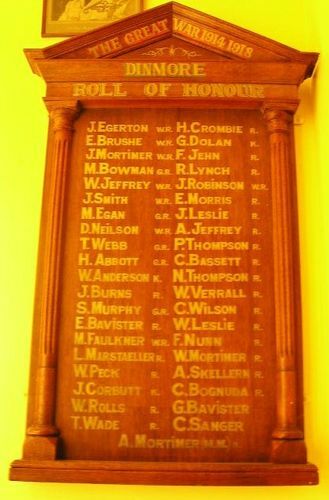 The Dinmore Roll of Honour was unveiled in the Alliance Hall on the 27th October 1916 by Mr F.A.Cooper M.L.A. The Brisbane Courier (Qld), 28th October 1916.